Topics: Clients, Bookstore, and Certified Speakers. It is hosted by Corecomm Internet Services Inc New York, using Apache web server. It has 2 DNS records, ns2.corecommhosting.com, and ns1.corecommhosting.com. 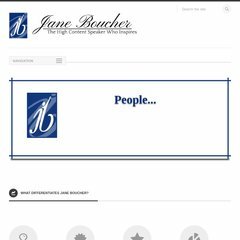 Janeboucher.com's IP address is 169.207.67.11. PING (169.207.67.11) 56(84) bytes of data. A time of 29.3 ms, is recorded in a ping test.